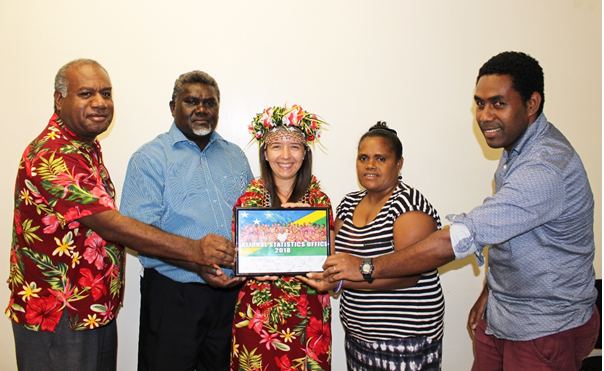 STAFF of the National Statistics Office (NSO) within the Ministry of Finance & Treasury (MoFT) gathered recently to bid fond farewell to Volunteer Erica Tolcvay. Ms. Tolcvay has dedicated a year to the NSO becoming a familiar face and a much-loved volunteer until her parting fortnight ago. Volunteering under the Australian Volunteers International (AVI) program, Ms. Erica worked as the Data Dissemination Policy and Communication Officer for the Solomon Islands National Statistics Office. During her stint with the Office (NSO) Ms. Erica has contributed a lot towards the Office development work program with the formulation of new embargo and data dissemination policies. At an organised farewell ceremony held on Tuesday 15 May, Ms. Erica said she has enjoyed her time with the NSO with many fond memories to ponder on when in Australia. Ms. Erica thanked the Government Statistician and the NSO staff for their support towards her job since she began work with the NSO until her send-off. Meanwhile, Government Statistician Douglas Kimi on behalf of the NSO thanked Ms. Erica’s contribution and service to the NSO since joining the team (NSO) last year. He said a lot has been acquired by staff of the NSO from the numerous trainings/workshops being organised and facilitated by Erica. Mr. Kimi also wishes Ms. Erica good fortunes in her future endeavours. Also as part of NSO’s appreciation to Ms. Erica’s input, gifts and presents of kinds were presented to her during the farewell party by the NSO management and staff. Ms. Erica is from Adelaide City, South Australia.